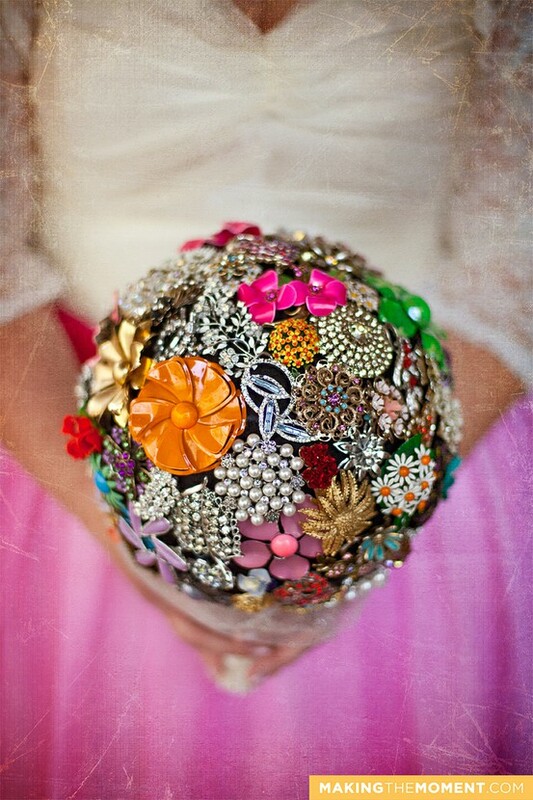 I'm in love with vintage brooch bouquets right now. They are growing in popularity for weddings but I think one would be adorable sitting in a white porcelain vase on top of my vanity. Miranda Lambert carried one on her wedding day, which was made by Jennifer Rose Diehl from The Ritzy Rose of Columbus, Ohio. 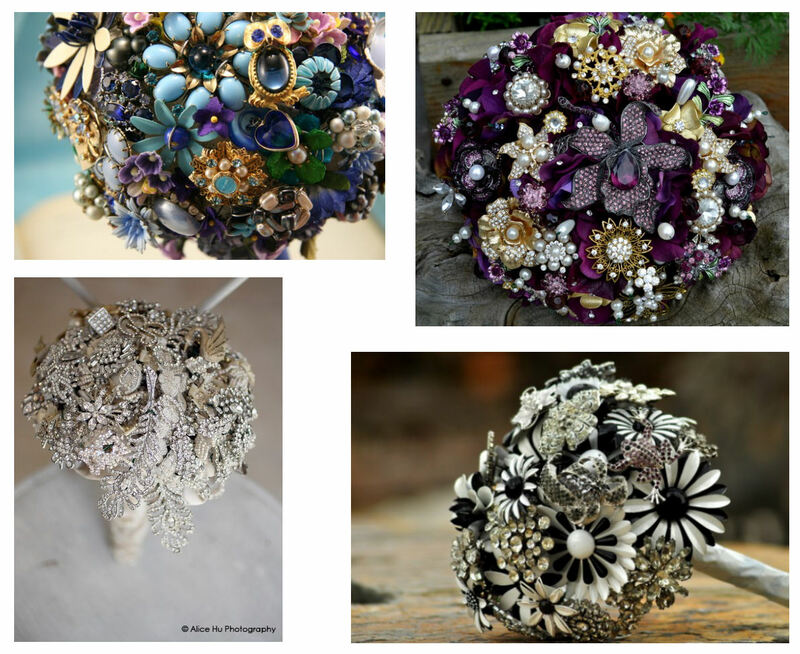 The idea is to collect vintage or vintage-inspired (or whatever style you fancy) brooches, earrings and other bejeweled accessories; attach each piece to a floral wire; arrange the bouquet and wrap the wires with fabric or ribbon. I found further instructions online here, thanks to Charming Charlie: http://www.charmingcharlie.com/blog/diy-wedding-bouquet. I think for brides the best way to make a bouquet is to collect pieces from loved ones. For a few days I thought I was a genius for thinking of this all by myself, but apparently Mrs. Shelton had the same idea. Ask each guest of your bridal shower to bring a piece of jewelry to the party. You can include an explanation in the invitation and specify color or theme. Your bouquet will be priceless! It will cost you little but represent all of the special women in your life. What I adore about these earrings is that you can easily dress them down (in skinny jeans, T-shirt and flats) or up (with a fitted mini, a slinky tank and bold heels). 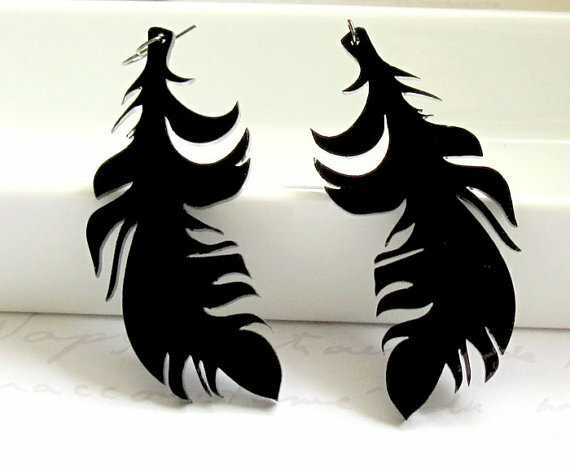 There have been so many times when I think to myself, “I need a pair of black earrings that are more fun than hoops but not too dressy.” These are perfect. I also adore the Victorian lace earrings, Moonlight Lady lace necklace and Marilyn Monroe necklace. Fans of the Harry Potter series have watched Emma Watson, who plays Hermione Granger in the films, grow from a spunky 10-year-old to a young woman of style and grace. At 21 years old she has demonstrated her preference for Marchessa minis, ornate details and earth friendly fashions. She will be seen next in ‘The Perks of Being a Wallflower’ and 'My Week With Marilyn,’ which means, lucky for us, we get to see what she wears to many more red carpet appearances. Take a look at several of my favorite style moments from Miss Watson. Rain or shine - it's summertime! 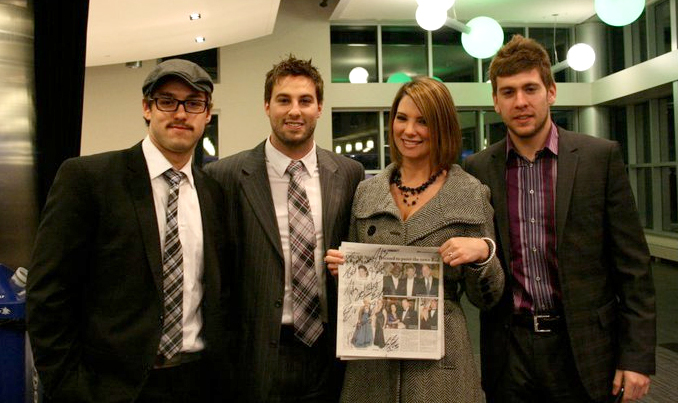 The Toledo Free Press published another article from Fashionably Kate! This time around I'm discussing summer trends and it features some trendy selections from Sophie's Sister, a sophisticated boutique located at 133 N. Michigan St. in Toledo. Tierney, a sales associates from Sophie's Sister, helped me pick out a few on-trend ensembles. 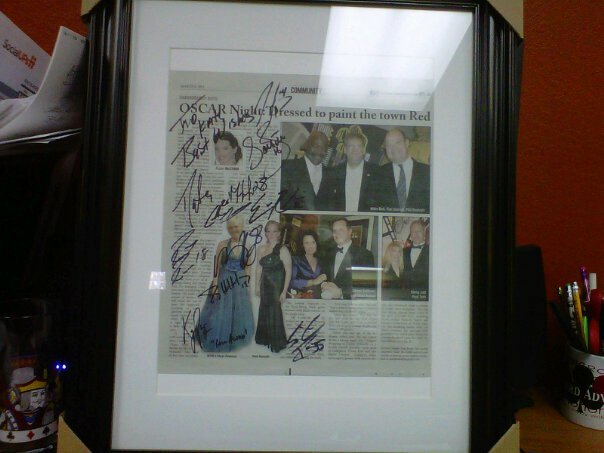 Unfortunately, not all of the photos made the paper, so for your eyes only, you can see them here! The finished product! Thank you, Teresa! Writing this article about the East Toledo Family Center's Gala was a pleasure, not just because of the wonderful people I met, but also because it gave me the opportunity to tell others about the Center, which has made such a profound impact on the community. Thank you, Betty Evans, for letting me in on the secret. The East Toledo Family Center may be the oldest community center in the Toledo area and on Saturday, April 9 members celebrated its 110th birthday at the annual renaissance gala. Dressed in their finest birthday attire, guests swayed to music by the Cakewalkin’ Jass Band. Demonstrating the significance of family at the East Toledo Family Center was band leaders, Raymond and Betty Heitger and their daughter, Nicole Heitger. Nicole is the center’s family resource director, as well as the gala’s gifted vocalist. Displaying their dance talent were members of the University of Toledo’s ballroom dance club including Hannah Fish and the club’s president, Kaylee Jones. Fish stood out on the dance floor with a 1920s inspired black feather from Claire’s in her hair, showing that accessorizing can be easy and inexpensive. Fashion elements from this stylish decade graced runway shows this year, foretelling that beadwork, sheath dresses and fur or feather details will be coveted. Wearing a sharp blue suit and scarf tied around her neck, Congresswoman Marcy Kaptur presented a congressional proclamation to the East Toledo Family Center acknowledging its 110th anniversary and the tremendous impact its services and people has made on east Toledo. Kaptur is a longtime supporter of the center and believes it should be a model for nonprofit employees to learn how to operate community organizations. Following the certificate presentation, Allison Brown of Fox Toledo News welcomed guests as the honorary chairperson. “I definitely sense that feeling of family that everyone has talked about,” Brown said of her experience with the center’s community. A big part of that family includes Helen Michael, who received the Century Award on Saturday evening. Michael began volunteering at the family center in the early 1940s when it was called the Neighborhood House. Located just a couple of miles from today’s facility, only a playground divided the house from Michael’s home. Her late husband, Gordon, and many of her family members were also involved with the center. The 96-year-old dazzled as she accepted the prestigious award Saturday evening in a purple glittering jacket and matching satin pants. Michael’s granddaughter, Deborah Skergan, also looked polished in a white sleeveless top adorned with black-trimmed rosettes and a black skirt with a ruffled hem. A black and white ensemble is a simple way to look chic and this classic style will become even more attainable since many designers recently featured it in their collections. Another black and white dress that caught my eye at the gala was punctuated by bright yellow. Jackie Langlois wore a floral dress with a yellow cardigan and black opaque tights while her husband, Bob, wore a matching yellow shirt. Mrs. Langlois’ advice for color coordinating is always to find the dress first, then your date’s shirt and tie. 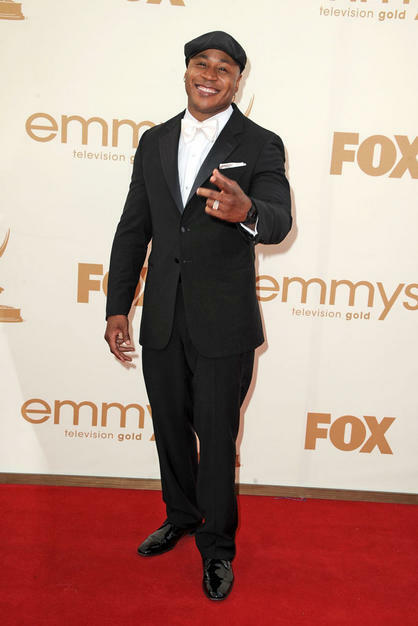 However, the most remarkable fashion statement was worn by Gala Chairman Richard Fisher. His white jacket was painted to commemorate the 110th anniversary of the East Toledo Family Center by Linda Sattler, a local artist and instructor. Fisher is proud to wear the center’s vibrant history on his sleeve. 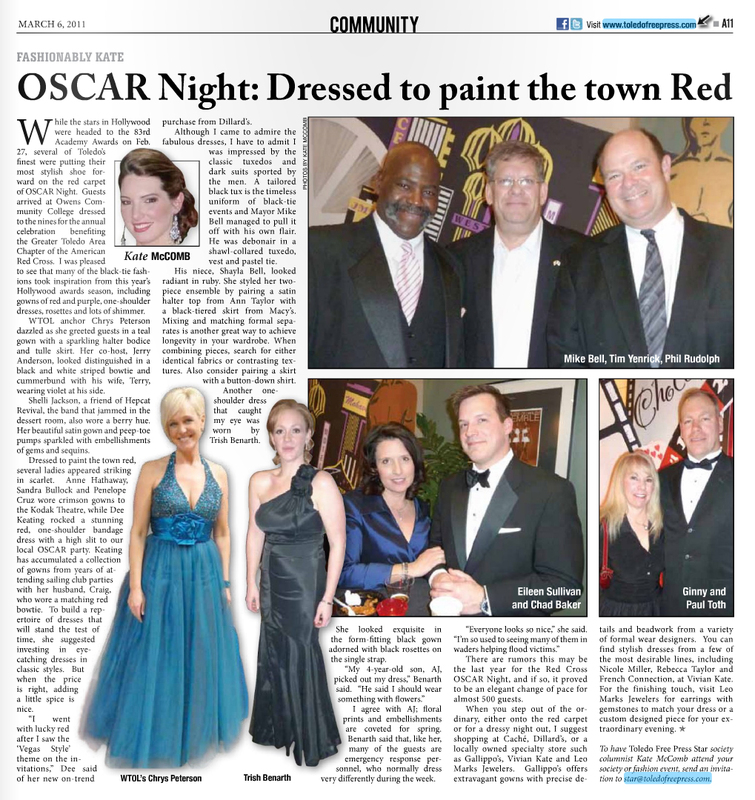 Fisher and his wife, Sandy, have helped with the gala, which raises funds to provide quality programs and services to enhance the lives of individuals and families by meeting emerging needs, since its inception 14 years ago. “We help seniors shovel their snow, we help the person who has just lost their job and we help struggling students learn and grow,” said Kim Partin, executive director of the center. Partin looked elegant in a fitted dress with a lace top and black tiered skirt. Lace continues to be fashionable, as well as sheer fabrics. For an up-to-date interpretation, try an antique inspired design, like Partin’s, or a completely lace dress. Irish Angel? You be the judge. 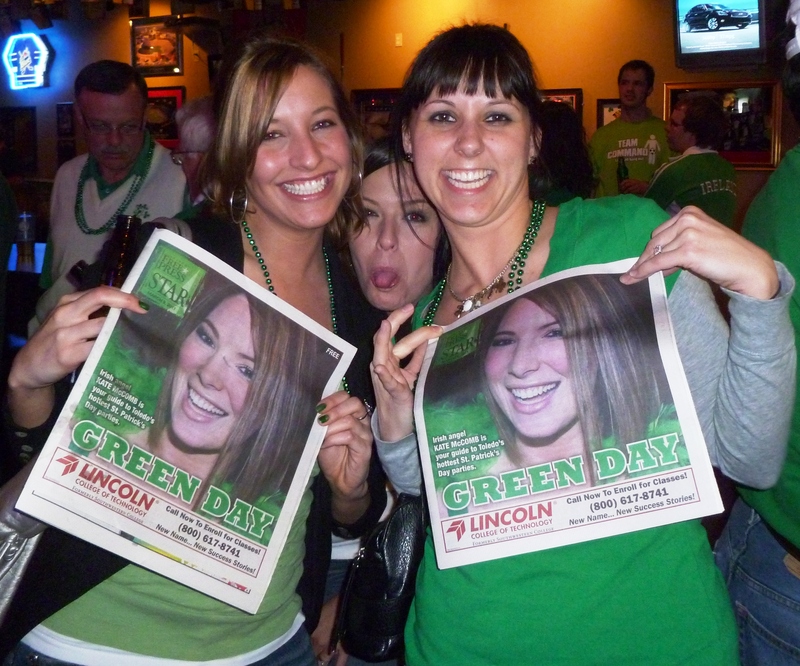 I helped the Toledo Free Press find where to go on St. Patrick's Day 2011. 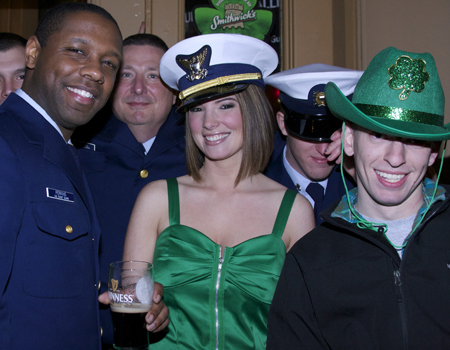 My Irish compass took me to The Claddagh, The Blarney, Mulvaney's Bunker and on the day of - Shawn's Tavern. 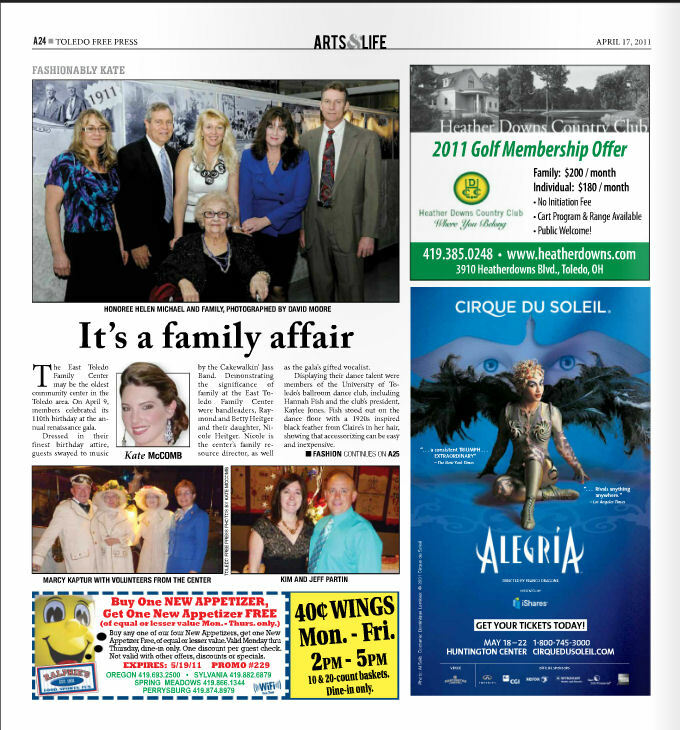 For the Green Day edition, visit http://issuu.com/toledofreepress/docs/star_030911 and turn to page 14. It all started when I sent the editor of the Toledo Free Press an email telling him why his paper needed a fashion-focused column and why I'm the one who should write it. He took the bait. 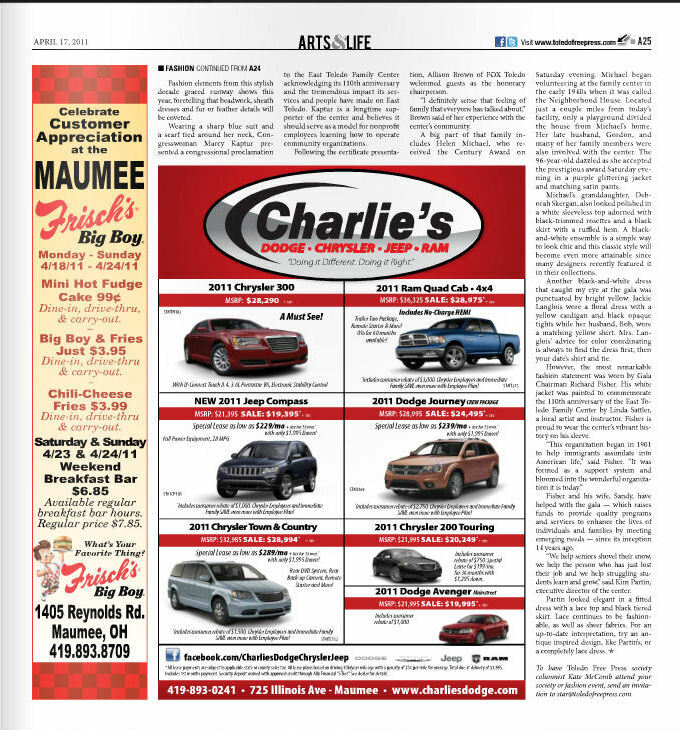 Now I'm writing for the weekly paper, attending local events and beginning a blog.